If your idea of a great documentary is having the real-life mass murdering protagonist singing about peace in front of a waterfall with stand-ins for his victims taking the metal wires used to kill them off their necks, presenting him with a medal and thanking him for sending them to heaven, all shot in Barbara Walters-style soft-focus, then this is the movie for you. This is something so surreal and horrific that, ethical qualms aside, absolutely must have been made a documentary of. 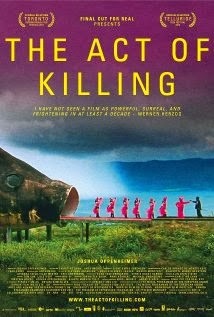 Despite the obvious issue of the subjects' perhaps deceit as to the true nature of the film, I think it was something that the director (and the big name exec-producers behind this, namely Werner Herzog and Errol Morris) couldn't in good conscience give up the opportunity to make. It is at once a historical document, psychological drama and participatory documentary (to use Nichols' convention). This is some dark stuff, and I've recently watched an interview where the filmmaker compared making his film to going into a Germany where the Nazis have won and interviewing Hitler. Well, that, except with more chubby asians in drag. Yes, there is humour in there too, at times maybe misplaced, but still. Overall an amazing film to watch, including the cathartic conclusion that brings a sort of much-needed but too-little-too-late kind of closure to the story, if not to the many victims and victims' families affected by the actions of the criminals presented before us.